IF YOU’VE LOOKED at the stack of fly-fishing catalogs on your bedstand lately, you’ve probably noticed a lot of recent growth. Just 15 years ago, fly fishers could reliably choose from a small handful of products for their wader, jacket, vest, and sundry other needs. Established companies such as Hodgman, L.L. Bean, Orvis, Patagonia, and Simms have been providing technical products for decades, but lately they’ve been joined by such upstarts as Albright, Cloudveil, William Joseph, and even Under Armour, to name just a few. Having all these new players at the table means an increase in competition—and where there’s competition, innovation thrives. Unfortunately, all that innovation can add substantially to the level of confusion when an angler walks into a fly shop and takes a couple wading jackets or pairs of waders down off the walls. 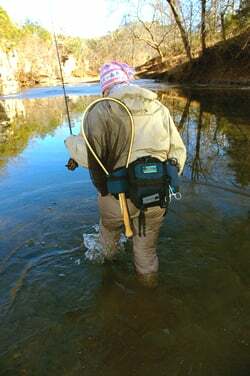 What makes a $350 wader a $350 wader anyway? Why is a $350 model worth more than the one that costs $99? To answer these questions, you need to understand a little about how fly-fishing clothing is designed and made. 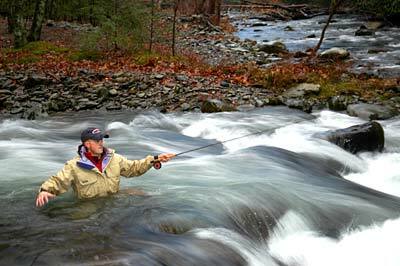 A Smokies angler works his way upriver. 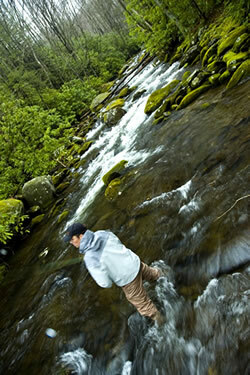 The Smokies provide the classic breathables environment — wet as wet, but hot and cold throughout the day.